Thomas Brown in a screen shot from his Thomas Vision Reef Channel. While I couldn’t make the test results or the University that did the testing public I did share the results and the University with Ret Talbot. Who wrote an article with is take this situation and the data behind it. Now I was painted as the man who cried wolf but that is just one mans take on it. Since Brown published this statement, I have received numerous inquiries about the test results. The purpose of this blog entry is to respond to those inquiries as best as I am able, and bring readers up to speed on the most recent developments in this ongoing story. 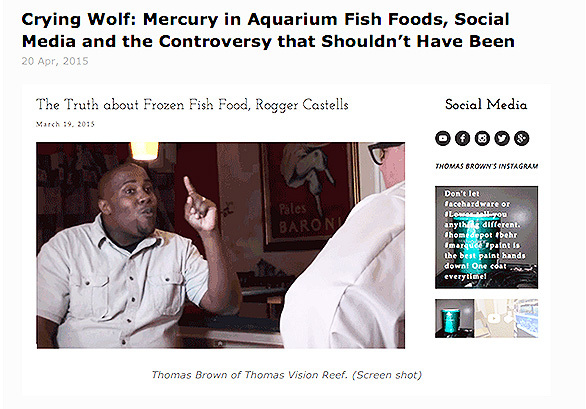 To briefly recap the story, the allegations of high mercury concentrations in a popular frozen fish food came Friday, April 17, 2015, from Brown, who claimed tests he commissioned with an associate, performed by “a local university,” yielded a result estimated to be in excess of 20mg per gram of mercury in a sampled fish food. Given that this result is 20,000 times the FDA threshold for human consumption and more than 10,000 times greater than concentrations of mercury in the most mercury-laden fish included in the U.S. Food and Drug Administration’s (FDA) mercury in commercial seafood database, Brown’s allegations received immediate attention. They were extraordinary–sensational, even. As a journalist who covers fisheries issues and seafood, including several stories about mercury in seafood, I was very interested in the claims being made by Brown. I knew immediately that telling this story needed to be about the data, so I obviously wanted to see the data supporting Brown’s claim. Before publishing my article in CORAL Magazine, I did what any journalist would have done: I requested the test results from Brown directly. After negotiating terms that were acceptable to Brown, he sent me the results. As per the terms, I agreed to keep my correspondence with Brown off-the-record unless legal action compelled me to disclose information or in the case that the data themselves revealed a threat to human health. Once my article was published, Brown told people he had sent me the results, saying, “I knew his article was not going to be in my favor but at least people would know we really had testing done.” The results Brown sent me included the names of the institutions involved with the testing, partial results of the tests and some commentary about the results. All of these details were to remain off-the-record, based on Brown’s terms under which he shared the results with me. After reviewing what he sent me, I concluded the information was not terribly credible in and of itself. The results were in the form of a forwarded email, not a PDF or a photograph of actual results (the latter is the sort of documentation an editor would require to feel confident even considering publishing such an extraordinary claim). While I didn’t automatically assume the results had been altered because of the way they were sent, I had no way to verify they had not been. Based on what Brown sent me, it appeared tests had been done. The alternative–that the information I was sent was completely fabricated–seemed a stretch, but independent verification would be necessary to validate the results themselves, especially the mercury result. I can confirm the results Brown sent me stated: “Estimated mercury levels exceeded 20mg per gram of product,” just as Brown claims. That result, however, remains hard to believe, especially given the fact that the format of the report itself lacks credibility. Remember, we’re talking 20,000 times the FDA threshold and more than 10,000 times greater than concentrations of mercury in the most mercury-laden fish included in the FDA’s mercury in commercial seafood database. Thomas Brown on his Thomas Vision Reef Channel from the first article in this series. Again, as any journalist would do when working on a story that hinges on the data, I reached out to several experts in the field, including a marine biologist named David Taylor. Taylor’s research focuses on mercury contamination in fishes. Working out of Roger Williams University in Rhode Island, Taylor regularly runs mercury analysis on marine-based samples in his lab. Taylor says if he got the result Brown reported back from a lab, he would assume it was an error and request additional analyses to verify the accuracy of the measurement. Taylor explains that the instrument he uses to measure the mercury content of biological samples could theoretically yield a result as high as Brown’s but that such a result would be based on an extrapolation beyond the range of his calibration points. “A sample with a mercury concentration of 20 milligrams per gram is equivalent to 20,000,000 nanograms per gram,” says Taylor. “Assume that the sample being analyzed weighed 10 milligrams–or 0.01 grams. This means the sample being analyzed has a total mercury amount of 200,000 nanograms.” The instrument Taylor uses has a typical working range of 0.05 to 600 ng, and the highest point on his calibration curve is approximately 800 ng. In other words, Brown’s result is greater than 19 million nanograms more than the high end of the normally tested range. “I suspect an error has been made in reporting the units,” Taylor concludes. Given the poor documentation, the lack of verification and the “highly unlikely” result Brown reported, I was not, as Brown indicated in his own public comments, convinced that a lab had performed tests and actually found this extraordinarily high mercury result. I did speak at length with Brown’s associate and, while I cannot reveal his name nor the full content of that discussion at this time because of the terms under which he agreed to speak to me, I can confirm that I stand behind what I published earlier this week, despite all the information I have seen both on- and off-the-record. I can also confirm that, based on additional documents I obtained in the course of my research, it appears clear that Brown took the action to share this extraordinarily high mercury result alone and against direct instructions from the person who provided him with the results. According to an unnamed source who has firsthand knowledge of the testing, as well as from documents obtained from Brown and elsewhere, Brown was clearly instructed not to share the results because the results were not verified, the data was incomplete, and the mercury result was quite likely in error. Furthermore, the individual Brown identified as his associate told me he was not working with Brown to test “the top three frozen reef aquarium foods” (their description) as Brown has claimed; rather the tests were, according to the source, part of his own research in pursuit of an academic degree. In addition to speaking to Brown’s associate, I, again as any journalist would do, reached out to the three entities involved with the testing and which were listed on the results Brown sent me and in other documents I obtained. Two of these entities are large, credible institutions, and, as Brown indicated in his public comments, one is a large university with an excellent reputation. The third entity is a lab associated by name with the university. According to the information Brown sent me, these institutions were working on the results “in coordination.” After fairly extensive investigation on their end, public information officers and media relations staff at the two institutions indicated that they had no knowledge of the existence of the lab listed in the report. This is despite the fact that the lab listed on the results uses the name of the university. Brown’s reasoning here is akin to a resident in a town saying he possesses lab results showing dangerous levels of radiation leaking from the local nuclear power plant. It is akin to that resident publicly standing by those results and creating fear and uncertainty in the town’s population despite the fact that the results are challenged and called into question by healthcare workers and experts in the fields of radiation exposure and nuclear energy. It is akin to the resident standing by those results despite the fact that the results lack credibility and that the institutions named in the results publicly disavow them. It is akin to that resident, in the face of all this credible opposition, positioning himself as a whistleblower and alluding to industry cover-ups–saying he’s pleased he started an important conversation about nuclear power. Without credible data, and in the face of such overwhelming reasonable doubt, the actions of this resident are clearly irresponsible and unethical. They may even be illegal vis-à-vis yelling “Fire!” in a crowded theatre when there is no credible evidence of a fire. If Brown wishes to regain his credibility, he will have to provide credible data to support his extraordinary claims, or else publicly retract his statements concerning excessively high concentrations of mercury in the frozen food in question. When asked Tuesday night if he still stands by the information he disseminated, he declined to comment, responding via Facebook message, “I have been told by my Lawyer to not talk on this subject anymore until other test results come out from sources other than myself…. For now I am just waiting on additonal [sic] test results and will not be talking further on the matter.” Brown continues to maintain his blog “for all those who would like to continue the debate”–a debate about lab results that have been thoroughly discredited, debunked and dismissed. While Brown has not named the manufacturer of the food publicly, leaving his unsubstantiated public statements out in the public sphere casts doubts on all frozen fish foods comprised of ingredients proven to benefit fish health. The onus should not be on a business to prove its innocence in response to any unsubstantiated accusation that an individual makes. The onus is upon the individual to bring forward credible data. Nonetheless, Brown’s statements have created uncertainty–a void that will now need to be filled, especially as long as Brown continues to refuse to retract his statements or provide additional, credible data. Given the ongoing potential harm to businesses and fish health as a result of Brown’s actions, I would not be surprised to see a coalition of industry manufacturers demand publicly that Brown retract his statements. The manufacturers with whom I have spoken both on-and off-the-record are concerned about the quality of their product, the reputation of their businesses and the safety of the pets their food feeds. Additional third-party testing is underway, and should be available soon, but there is no reason to leave this uncertainty and fear created by Brown unaddressed any longer. The devil is in the data, Mr. Brown. Nicely reported Ret. Thank you. I hope you can pursue this and find out accurately what the levels of mercury are in those products. I am not a lawyer, but how is this any different than the people claiming that dooms day is around the corner or that “Jesus is coming!” Implying that the world is coming to an end? Your analogy about screaming “fire” in a movie theatre seems a bit exaggerated, all things considered. I see worse journalism and claims that this and/or that product doesn’t work than what TB reported is social media. Should all those people be sued also? I foresee no successful legal suit in the future, but it may cost TB money to defend attempts at such. Worst of all, he will probably lose credibility with many reefers in the world, but he will probably net more viewership than he had before this report in the end. With all journalism, whether researched or not, it is all about web hits. You my friend are capitalizing on the same principle. Your article continues to spread word about the possibility of high levels of mercury in our fish food. You certainly made it clear that you disagree with the results, and I applaud you for attempting to research and state the facts; but the fact is…you have not disproved anything. I suggest the manufacturers conduct their own tests and make them public… Unless there is something to hide. John, your comment is extremely disheartening. I feel as if you both failed to read the reasoning behind Ret’s posts and want to blame “views” on his contradictory stance. Would it be better to just ignore the information? Or the fact that the data provided is straight up preposterous on its face? If we want fish food companies to test for mercury, that’s well and good, but it shouldn’t be due to a fallacious claim. As the saying goes “extraordinary claims require extraordinary evidence.” Thomas Brown’s reaction to that number should have been to suspect an error. Instead he takes to the public and becomes famous overnight. Whether he intended that results or just lacked the scientific foundation to understand why that number was probably an error, we’ll never know. But it’s silly to demand fish food be tested for mercury based on bad science. He needed to prove his extrodinary claim and did not. I’m just disappointed that now we’ll have companies testing for Hg with the public not understanding the significance or that fish tolerate mercury differently than people. I fear the future where manufacturers are fighting for lower Hg content to appease the masses, while forgoing other important nutrients. All because someone got the units wrong. Aren’t you being just as presumptuous and quick to draw a conclusion as TB. Why is it so unbelievable that the test results were accurate? I understand the minute levels inherently present in seafood and that there could never be levels as high as the levels reported by TB. The math makes sense, but it makes one large assumption: there is no contamination. After all, this is processed seafood. Even though the original source is the same as what we eat, what happens after the seafood arrives to its destination, is completely different. I understood the article just fine. Maybe you should reread my post. To summarize, I was merely rebutting the notion that a lawsuit would be brought against TB and pointing out the fact that writing an article on this subject matter further propagates the “fear” mentioned in this article. “Officials” would most likely lead to identifying the university. Is Mr. Talbot now hiding behind the same cloak as TB? They both agreed to not release pertinent information and are standing by such agreement. Yet, we criticize one and praise the other. so I guess all manufacturers are guilty till proven innocent John. No matter what credit less hack lobs them from the sidelines. Manufacturers are already monitored heavily, Mr. Brown, a non scientist using the cover of free speech to harass non-sponsors with safety doubts is irresponsible and unforgivable. No, I’m not. Because science. Because the figure cited by Brown was so absurdly high that his first thought should have been double, than triple-checking his data. He should have assumed it was a mistake, full stop. He should have sought to disprove those results and only once they held true over repeated tests, presented his findings. Because that’s how you do science. I’m not sure how you can make the claim that Ret isnt being transparent; he even talks to and cites a specific expert, so you don’t have to take his word on it. The only things not disclosed are those he agreed not to disclose on privilege of discussion. Largely something Brown asked for. I really can’t see how you can make the same comparison. Unless journalistic integrity bothers you? No, I'm not. Because science. Because the figure cited by Brown was so absurdly high that his first thought should have been double, than triple-checking his data. He should have assumed it was a mistake, full stop. He should have sought to disprove those results and only once they held true over repeated tests, presented his findings. Because that's how you do science. I'm not sure how you can make the claim that Ret isnt being transparent; he even talks to and cites a specific expert, so you don't have to take his word on it. The only things not disclosed are those he agreed not to disclose on privilege of discussion. Largely something Brown asked for. I really can't see how you can make the same comparison. Unless journalistic integrity bothers you? Tami, Aren't you being just as presumptuous and quick to draw a conclusion as TB. Why is it so unbelievable that the test results were accurate? I understand the minute levels inherently present in seafood and that there could never be levels as high as the levels reported by TB. The math makes sense, but it makes one large assumption: there is no contamination. After all, this is processed seafood. Even though the original source is the same as what we eat, what happens after the seafood arrives to its destination, is completely different. I understood the article just fine. Maybe you should reread my post. To summarize, I was merely rebutting the notion that a lawsuit would be brought against TB and pointing out the fact that writing an article on this subject matter further propagates the "fear" mentioned in this article. In fact, some of Mr. Talbots claims of speaking to university representatives are unsupported. Obviously, the names of these "Officials" would most likely lead to identifying the university. Is Mr. Talbot now hiding behind the same cloak as TB? They both agreed to not release pertinent information and are standing by such agreement. Yet, we criticize one and praise the other.